PremaLox C Cerium Oxide Powder is a 99.95% pure, white, cerium oxide powder. It is ideally suited for precision polishing of ophthalmic lenses and optical glass. Offered in 0.5 µm, 1 µm, 2 µm and 10 µm, PremaLox C Cerium Oxide Powder offers high efficiency polishing resulting in an excellent finish. Applications: Ophthalmic lenses, optical glass. Our PremaLox Ceria Powders have been formulated using PremaLox C 99.95% pure cerium oxide with proprietary additives to ensure superior suspension and flow properties when the product is made into a slurry. The unique suspension treatment keeps the abrasive particles dispersed for longer periods of time allowing for less agitation than most economy grade cerium oxides. - PremaLox Ceria E - economy grade powder available as 10µm, 2µm, 1µm or 0.5µm average particle size. - PremaLox Ceria S - standard grade powder available as 10µm, 2µm, 1µm or 0.5µm average particle size. - PremaLox Ceria P - premium grade powder available as 10µm, 2µm, 1µm or 0.5µm average particle size. Our CerPreme-OP Cerium Oxide is designed for the most precise polishing on critical components where general conventional abrasive slurries cannot compete. It is formulated from our proprietary blend of ingredients that allow for superior suspension and flow properties. The material is graded to a tight particle size distribution with the majority of the particles being below 1 micron. The soft settle suspension properties of our CerPreme Line of products produce a slurry that requires minimal agitation in order to remain in suspension. Simple aeration will provide sufficient energy to maintain an appropriate mixture. Our CerPreme Product Line is compatible with soft and hard laps, pads, metals, and composites. Excellent results can be achieved when finishing on a pitch lap such as Gugolz or any number of synthetic pitch products. Applications: Examples of materials polished with Cer-preme slurry include all manner of glass, fused quartz, single crystal quartz, zinc selenide, single crystal silicon, and flourides. Our PremaSol CerPreme Slurries have been formulated using PremaLox C 99.95% pure cerium oxide powder with proprietary additives and an aqueous base to ensure a slurry with superior suspension and flow properties. The unique suspension treatment keeps the abrasive particles dispersed for longer periods of time allowing for less agitation than most economy grade cerium oxide slurries. - PremaSol CerPreme E - economy grade aqueous slurry available as 10µm, 2µm, 1µm or 0.5µm average particle size. - PremaSol CerPreme S - standard grade aqueous slurry available as 10µm, 2µm, 1µm or 0.5µm average particle size. 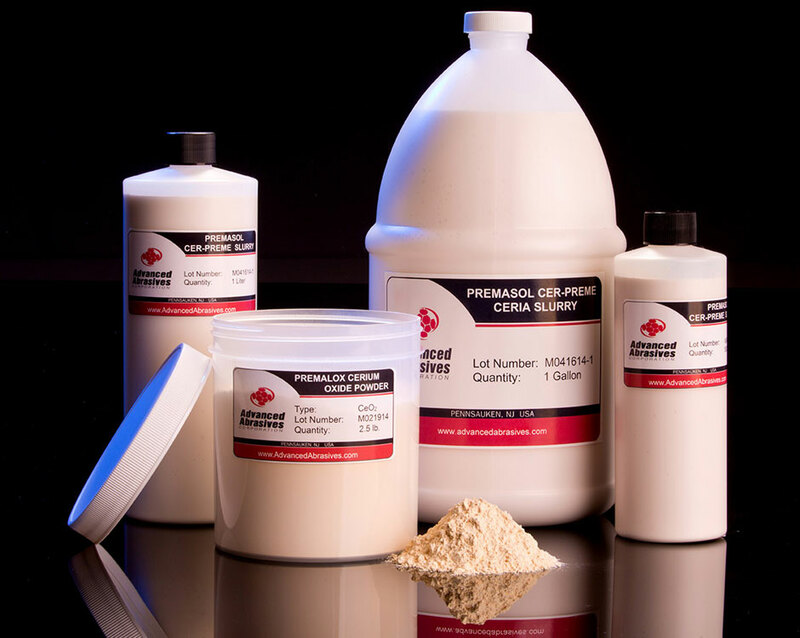 - PremaSol CerPreme P - premium grade aqueous slurry available as 10µm, 2µm, 1µm or 0.5µm average particle size. Applications: Examples of materials polished with the three grades of PremaSol CerPreme E, S or P slurry include all manner of glass, fused quartz, single crystal quartz, zinc selenide, single crystal silicon, and fluorides.